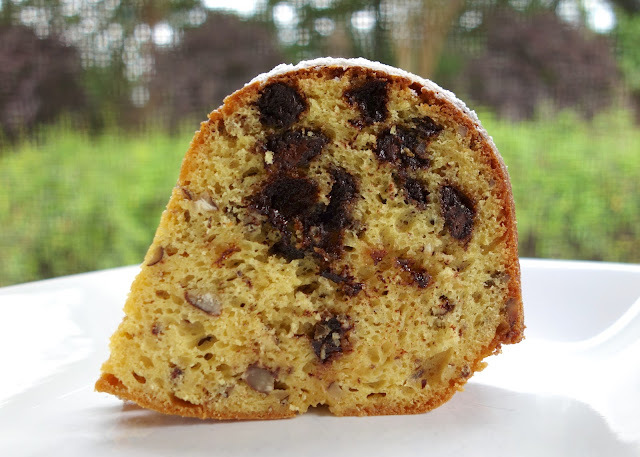 Chocolate Chip Cookie Pound Cake - SO delicious!! Yellow cake mix, vanilla pudding, eggs, water, oil, vanilla, chocolate chips and pecans. Took this to a party and it was gone in a flash! SO moist and delicious. All you need is a scoop of vanilla ice cream and you are set! YUM! Do you love chocolate chip cookies? Do you love cake? Then this cake is for you! This cake tastes just like a chocolate chip cookie! YUM! This cake starts with a yellow cake mix and only takes a few minutes to whip up. I added chopped pecans, but you can certainly leave them out. The cake is very moist and not super sweet. I think this also might be good as cupcakes. According to Chicken Legs, this is best served warm with ice cream. I have to agree! Preheat oven to 350ºF. 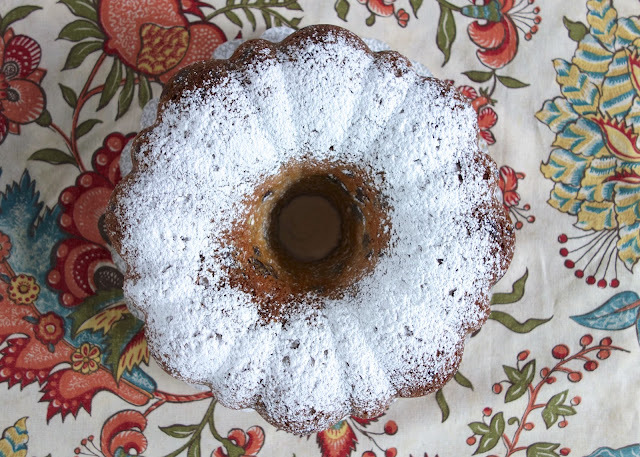 Grease and flour 10-inch Bundt pan. Set aside. Combine cake mix, pudding mix, eggs, water, oil and vanilla in large bowl. Beat at medium speed with electric mixer for 2 minutes. Stir in chips and pecans. Pour into prepared pan. Bake 50 to 60 minutes or until toothpick inserted in center comes out clean. Cool in pan 25 minutes. Invert onto serving plate and cool completely. Dust with powdered sugar. Looks delicious! I have a question, though; in your photo, it looks like all the chocolate chips in the batter fall down to the bottom of the Bundt pan. I've never actually tried this, but I've read that if you flour heavy ingredients (such as raisins or nuts) that will keep them from sinking down. Do you think that might work with chocolate chips, too? Tracey - you can certainly give it a try. I have done that with blueberries. Sherrie - so glad you are enjoying the recipes! I really appreciate this recipe and use it all the time. I participate in a weekly event for which I provide a cake, and I use this as my basic recipe. Sometimes I switch the cake mix up, as well as the pudding flavors and chips. For the holidays I used chocolate fudge cake mix, chocolate fudge pudding, mint extract, and Andes mint chips. I saved some of the chips, melted them, and drizzled that over the cake and then sprinkled crushed candy canes. My point is, don't be afraid to play around with this. Also, I've never had a problem with the chips sinking to the bottom -- except when I used white chocolate. They apparently have a different melting point because both times they all sunk to the bottom and were a mess. Anyway, thanks for the recipe!